Getting in touch with my Italian Roots! This Stuffed Meat dish reminds me of my Grandparents and it was already Paleo. Line baking dish with the Olive Oil and half if the Crushed Tomatoes. 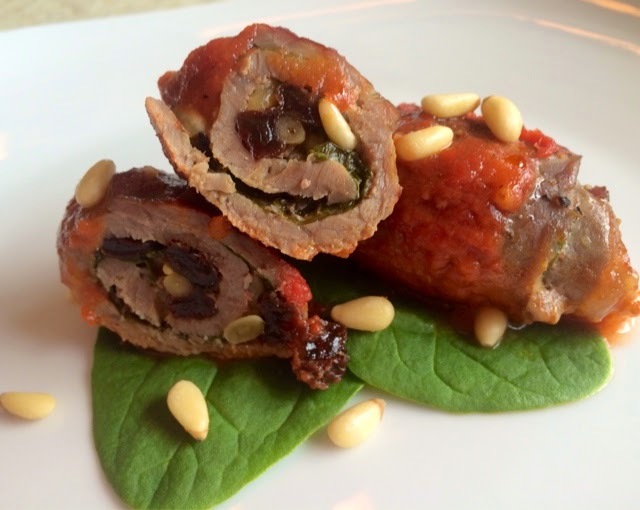 Roll each peice of Steak with Raisins, then a few leaves of Spinach, then some Pine Nuts. Use a toothpick or spear if needed to keep roll tight. Make sure they are all evenly done so they will cook evenly. Layer remaining Tomatoes on top and bake covered at 325 degrees for 25-30 minutes until meat is tender.